A year or so before he died, some time before he knew that cancer was killing him, Iain Banks held a reading event at the Ropetackle Arts Centre in Shoreham, just along the coast from Brighton. There are few people I would call a hero. As a reader and a writer, he was my hero. An inspiration. Myself and one of my best friends, Jon went along. 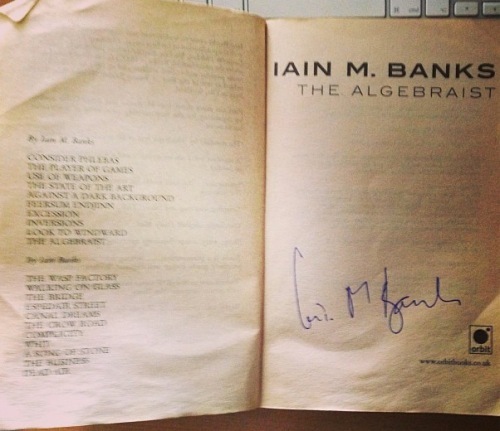 We had both been fans of Iain’s work since we were teenagers, especially his science fiction novels. He was a lovely man – his personality bounced around the room as he bounded around the stage talking quickly, with wit, self-deprecation, honesty and insight. If you’d met him socially, you know he would be an absolute bloody delight to spend time with. Ideas, wild avenues of thought, enthusiasm, delight in being alive – all these things were abundant in his conversation, or bursts of monologue, I suppose, with us, his readers. I didn’t blog about it at the time – but I’ve been meaning to ever since. He said some really interesting things. After a reading from his then just-published novel Stonemouth, Iain answered questions from the audience – with the strict condition that there were no questions about “where do you get your ideas?”. Inevitably, and as he’d predicted, variations on this question made their appearance anyway. These are some things he said that stayed with me, that I want to remember and share… They come with the caveat that I didn’t take notes or record it, so they more my interpretation of what I heard, rather than direct quotes. There are, Iain, said three things that can make you successful as an author – and most likely in any other creative pursuit. Talent – you’re bloody brilliant and people can’t get enough of it. A natural! A genius! Perseverance – you write and write and write and will not give up no matter what they say. You take the knocks, get back up again and write some more. Successful authors, he said, need at least two of these things. You can be talented, but unlucky and give up. You can be lucky, but not have the talent or the tenacity to exploit it. You can be determined and dogged, but without the talent or some luck, you will just be producing a lot of words. …they are just more diligent about capturing them and doing something with those ideas. It’s about discipline in the end – the trade, graft and craft of turning ideas into stories, into reams of copy. Note them down, let them brew. I’ve been thinking about this a lot, as one of my holiday and spare time pursuits has been working on a novel – still very much at the outline stage. By the way, Writing the Novel: From Plot to Print, by another author-hero of mine, Lawrence Block has great advice on this processing and percolating of ideas for fiction. I’ve linked there before, but he expanded on this theme in his last interview with The Guardian.